Kerala, where the Bishop is above law, at least for now. If you or I were accused of a sexual assault, it is likely that we will be able to speak our first feeble words only after police has done some work on our back in custody, within most probably hours of a complaint being lodged. 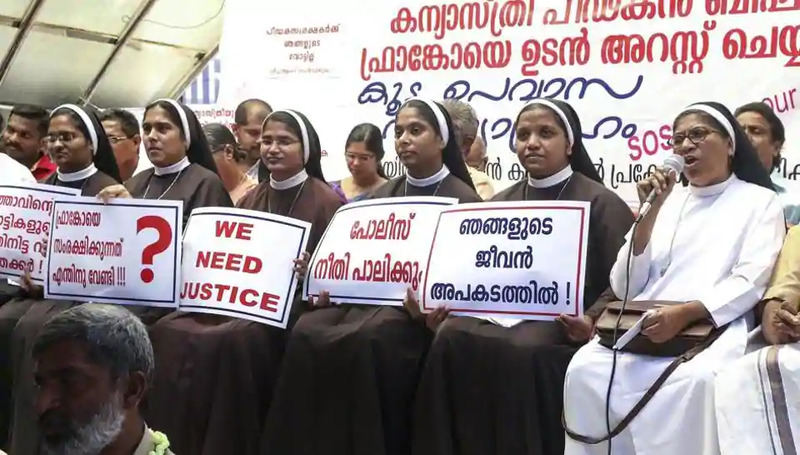 Here in Kerala, we have one Bishop of Jalandhar who has been accused of sexual assault and has not been arrested for seventy-six days. It is a nun who work under him, the accuser in this case. An MLA (member of legislative assembly) known as PC George, openly bad mouthed the same assault victim. She has come out to complaint despite all the embarrassments and difficulties in society a complaint of a sexual assault might bring along for her. However, she is still waiting for some firm action from the police after 76 days. Photo Courtesy : The Hindustan Times. That’s especially critical when the victim is a nun who is living under vows of poverty, chastity, and obedience. Do not forget that Kerala witnessed multiple cases of police custodial deaths even in the recent years. In our country where there is no dearth for laws protecting women’s rights, when a victim comes forward risking even their life, against powerful men, they get no proper support from anyone until the media sensationalizes the case or they themselves go out and launch a protest strike against inaction. It is an unprecedented case that nuns are staging a protest strike. However, such a strike against police inaction is currently being witnessed by Kerala. There is hardly any hope for the ordinary when case after case we see two type of justices being served to people. The first one goes slow or goes soft. This type is for rich and powerful. The second one is swift and strong. That’s reserved for the ordinary people. This writer personally loves democracy above all other systems. But it is bewildering to see what is going on. I also believe that the root cause of these evils is lying in the dishonest and incapable leaders we select to rule us. Majority of these leaders end up protecting their vote base rather than you or me. Where do they have the time to serve the ordinary people and work on a development agenda as they are always embroiled in distractions that they themselves help create through their protectionism of the rich and powerful from the claws of justice systems. The arrest of an accused does not mean much as far as the accused is concerned. But it is an essential first step that helps make sure the investigation is not influenced by the accused and that the evidence is not tampered. The accused has all the right to establish his innocence in a court of law. However, our state administration and police which is controlled by that administration is thinking and taking baby steps and still wondering whether to get the Bishop arrested. In the Bishops case, it is a fair doubt that whether the police and authorities are creating an environment for the Bishop to tamper the evidence by giving him ample time before any serious action such as arrest is taken. An impartial political leadership may be too much to hope for the ordinary citizens. However, a resemblance of such an impartiality will go a long way in restoring the faith of those who voted for our leaders. I hope it is not hard for our leaders to produce such a resemblance of impartial action against injustice. In closing, I would like to make two crucial observations. The first one is, I would like to remind the reader the saying that the “justice delayed is justice denied”. It is my fervent hope that it does not happen in the case of a nun who chose to lead an ascetic life. Secondly, we, the citizens must look for a way to be able to chose just, honest, and capable leaders who would do the right thing under all circumstances.